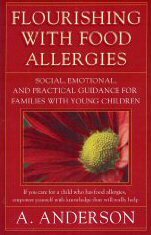 An empowering guide for those who are coping with a food allergy in today s world. By sharing her own personal experiences and successes, as well as those of numerous families, doctors and teachers, author A. Anderson has provided an immense and invaluable compilation of practical experience. The book begins by showcasing fifteen case studies of families who have successfully handled food allergies in their young children. These case studies offer parents and caretakers an opportunity to learn about social, emotional and practical aspects of raising a child with food allergies. Seven additional interviews from a variety of doctors and teachers are provided for professional perspectives, advice and positive support. They describe different experiences, attitudes, and beliefs about the increase in food allergies in children and other disorders that might be affected by food allergies such as asthma and ADHD. This practical and positive guide is not just for parents, Grandparents, aunts, uncles, teachers, caretakers, pediatricians, therapists, school cafeteria and restaurant workers will learn valuable information about how to handle food allergies and support these children. The book also provides a number of other tools, lists of food ingredients and additives to avoid, school and travel preparedness checklists, and discussions of myth versus fact relative to food allergies. Further, the pros and cons of a 504 Disability Plan are explored and compared with a less formal Action Plan for handling food allergies in children attending school. In addition, Anderson relies upon her personal experience in finding food-free activities and handling food-filled events to further empower families and children cope with food allergy-related issues. All of these tools seek to educate and prepare caretakers both in practical and emotional terms and avoid scare tactics sometimes found in other sources.